Sony 50MP Medium format sensor is being used the Fuji GFX50S and Hasselblad X1D. SO, its a great news for Medium format lovers that new generation of MF sensors are coming. These sensors will feature 150 MP resolution to give you enormous details. The current generation of Sony MF used inside the camera uses FI (Front-illuminated) technology now the next generation of sensors are being developed on BI (Back-illuminated ) tech. That clearly indicates that next gen of sensor will have better dynamic range and low-light sensitivity. Recent press release published on Nov 9, 2017 confirmed that next generation of Medium format sensors will feature 4K and 8K Video modes. Today Hasselblad finally revealed its X1D mirrorless camera today, the camera features 50 Megapixel Medium format sensor and ISO range upto 25600. The camera also features dust and weather resistant body and instead of announcing new flash range they made Hotshoe compatible with the existing Nikon flashes / Speedlights. Two new lenses also announced with the system, 45mm F3.5 and 90mm F4.5 and more lenses are coming shortly , we expect a bunch of new lenses is coming at Photokina 2016. 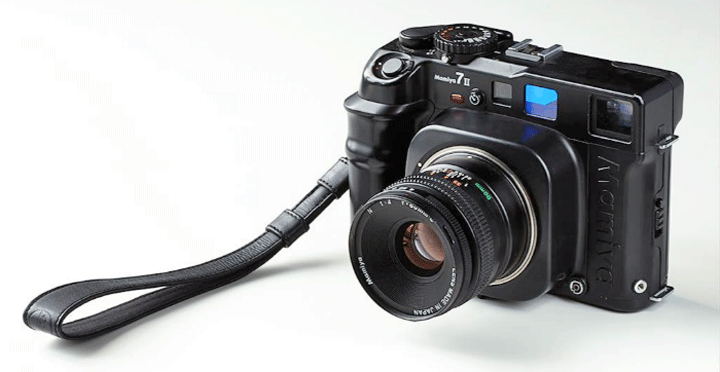 All the existing Hasselblad lenses are usable with the help of a external adapter. Second teaser image of Hasselblad upcoming camera published at Facebook today. From the image we can see that camera Jog-dial button on the top of the camera. I can confirm from the facebook post tags that the camera manufacturing unit is located inside Sweden and ucoming camera will have Medium format Sensor. We can speculate now the upcoming Camera is world first Medium Format mirrorless camera or may be compact camera, however we have to wait and watch. We have told earlier you you that Hasselblad is going to announce Medium-format mirrorless camera today. Petapixel leaked the images of the upcoming camera and also confirmed that the upcoming camera from Hasselblad name is Hasselblad X1D. You can look at images of the camera without lens, the Medium-format sensor look gigantic, however Hasselblad managed to maintain sleek and flat design of the camera. The price of the camera is expected to be around $8k and the official announcement is within next few hours. After a long break finally Pentax is planning to announce the 645D successor. Pentax 645D II get discontinued at B&H shop, Pentax ended up the production of 645D few months ago now retailers are clearing up stocked units for the arrival of new Medium format camera from Pentax. On January 4th, 2016 Phase one medium format new Back XF 100MP announced with Sony 100Megapixel CMOS Sensor. Now Pentax will use the same 100 megapixel CMOS sensor in its upcoming Pentax 645D II camera (name not confirmed yet) with advance core specification and 4K video. So if everything goes fine than we will sure see Pentax 645D II on Photokina 2016 with a Sony 100 Megapixel Medium Format Sensor. So in the upcoming Photokina Event we will see come big surprises from Sony A9, Canon 5DMk4 and Pentax. On January 4th, 2016 Phase one medium format new Back XF 100MP announced with Sony 100Megapixel CMOS Sensor. According to latest rumors surfaced over the web Sony is finally preparing to announce medium format camera for this Photokina 2016 along with new series of Medium format lenses. A high ranking Sony distribution guy just told me not to be too fast going towards Hasselblad. He hinted towards Sony releasing a medium format camera at Photokina together with a series of new lenses. As the presentation of the Hasselblad I was pretty disappointed as 4K video did not work yet and the Phocus software couldn’t process the raw files right, it will take until June/July anyway to decide if this makes sense – so I will wait until Photokina. There seems to be a good chance that we see the world’s first mirrorless medium format camera from Sony. So we may finally see world first mirrorless camera from Sony this year. But if the rumor is true then Sony may halt all the Fullframe and APS-C mirrorless announcement this year. Hasselblad camera is now available for pre-order at B&H store, click on the links below to Jump on products page. you can look the announcement here and must see H6D Sample images with Videos [High Res. Link included]. Hasselblad H6D Sample Images and Videos both are now available, and I have seen the samples of the camera all the images look so stunning and Sample Video of H6D created by Carl is really awesome. I recommend you to download high resolution Zip files to enjoy the image quality of the camera. The clarity and the details captured from the H6D is stunning.